We may know - perhaps even at first hand - of a gap in society whose presence causes pain for countless individuals. 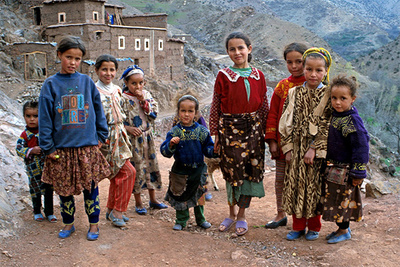 Here in Morocco, such a void - that of unrelenting poverty - exists, particularly in rural places (where poverty is typically most concentrated worldwide) and most of all in mountainous areas of the Kingdom. At the same time the people identify clear opportunities for prosperity that lay tantalizingly close to hand but remain unreached year after year. The late social scientist Charles Tilly suggested that the disparity between unfortunate life conditions currently experienced and the improvements that we can envisage but feel we are denied, is a primary condition that propels socio-political movements that could lead to conflict. Through the ages we have recognized, and the United Nations celebrated this month this self-evident truth, that happiness is fostered by our connections with others. This is entirely appropriate in human development terms since dire socio-economic conditions are most effectively reversed by individuals and groups connecting and communicating, utilizing a participatory democratic approach. When such procedures are employed to create locally-managed development, empowering beliefs are engendered among the beneficiaries, along with the joy that accompanies greater self-determination. In essence, the elements that are crucial for project sustainability also lead to happiness. Imagine the feeling of belonging to a marginalized community possessing little momentum for change. One day, a community dialogue facilitator starts to organize - and catalyze - meetings where members of every household work through their differences and describe their visions for the future, all with the aim of defining a shared action plan for the change they seek. Mobilization for development requires that spark, whether it is supplied by an external agent or local women’s leader, association member, government worker or trained citizen. After all, it is very rare that a community will come together spontaneously to resolve differences in order to advance common action. Further, even in countries such as Morocco, where the law requires the forging of development plans based on the people's collective will, the actual implementation of a genuine participatory experience may remain elusive. Individuals capable of acting as effective catalysts for change are, therefore, those who have undergone experiential training programs where they learned how to facilitate community dialogue in real settings. Let us assume that a development plan reflecting the people's priorities is in place. While this is a necessary and positive first step, the battle is not won yet; a successful transition toward implementation requires its own set of fortuitous opportunities. Raising funds to establish projects requires partnership building at the beginning of the process, when communities determine their most important initiatives, so that prospective contributors are drawn into the participatory planning experience at the earliest possible stage. In rural Morocco, the odds of receiving project funding are even lower since illiteracy rates are a significant factor in inhibiting the required type of communication. Potential donors worldwide would be both wise and magnanimous were they to accept proposals submitted in ways that are easily communicable by beneficiaries - orally or written in traditional (and often endangered) local languages. Finally, let us imagine that the catalysis and facilitation of community dialogue actually results in shared plans for projects, to which donors are prepared to contribute financially and beneficiaries, through labor in kind and in vital other ways. This manifesting into reality of a self-determined idea or goal is a source of empowerment, in an internal and an external sense. The experience builds confidence, a sense of self-reliance and a belief in the efficacy of collective action while also honing technical and managerial skills. When communities are fortunate enough to enter the implementation phase, almost without exception, in my experience, there occurs at least one ‘golden moment’ of reflection, wonder and deep appreciation. The people consider how far they have travelled to arrive at a moment of concretization - of building or planting, teaching, learning or making a presentation - and how unpredictable the path they have traversed, guided by the principles of participatory democracy. These instances are truly happy as, however fleetingly, they encapsulate the feeling of fulfillment which, once recognized, can be the more easily attained in the future. Sustainability then, necessitates popular participation, bringing in its wake both the empowerment we seek and the happiness we need.